State-of-the-art photo restoration services for discolored, faded, poorly printed, torn, crooked or damaged old photographs. Or, all of the above! We carefully assess the photograph for color shifts, loss of saturation, "muddiness" in the blacks and whites, dust and scratches and tilting. Sometimes there is a good image that needs cropping to bring attention to the main subject. We can enlarge images preserving the best quality. Sometimes, we are asked to remove unwanted family members, or to add people who didn't show up﻿! 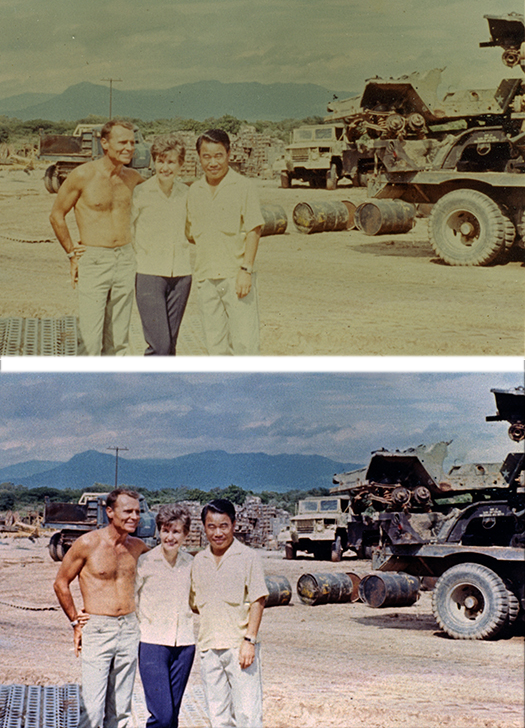 ✓ FREE PRINT to 8" x 10"
One of the most common photo restoration problems we see with older color photos is fading or a color shift caused by the differential fading of just one of the print colors (cyan, magenta or yellow). Another problem we fix on a regular basis is wear and tear suffered by images that never had the good fortune to live behind glass in a nice, safe frame! We restore photo scuffs, dust and scratches, photos stuck to glass, and all manner of image ailments! Pro-grade photo software allows us to select the best custom designed algorithms to achieve the best quality for enlarging photos. Prefer to enlarge (or reduce) your own images? Here are some DIY photo resizing suggestions. Adding & Removing People From Photos? Divorce - and bad boy/girl friends - means we get a steady stream of requests to take people out of photos. Tricky - but doable. And, we can add people back in if they missed the snap for any reason! about your photo restoration today! Staining, rips, scratches, water damage, discoloration, fold marks, glass-stuck, missing pieces, pen or crayon marks... Did we miss anything? 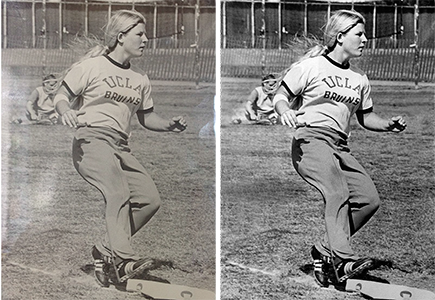 Good news: almost any photo repair issue can be fixed! More art than technology, black and white images can be digitally hand-colored to bring out original color detail. Or if fading or staining of a color photo is extreme, then selected areas can be targeted. Have a photo or graphics project that needs a pro touch? Or a one-off poster, book cover or DVD box design? Check out our previous work then give Jane a call to discuss if we would be a good fit for you. At PhotoFixRestore we use a range of photo printing papers - doing our best to match the original or to enhance the signal features of the restored photo print. Here below are some of our favorites. (In addition to these papers we also have a premium glossy and a premium semi-gloss.) You don't need to be an expert in such things - just make sure your photo restorer is! Velvet Fine Art Paper is a 100% Cotton Rag paper designed to reproduce photographic images with vivid color and high black density for exciting and rich prints. Epson guarantees its velvet surface produces prints with a museum quality appearance and easily supports the highest resolution output for restored photos from the best photo printers. Ultra Premium Photo Paper Luster delivers highly saturated prints by guaranteeing maximum ink coverage and a high D-Max for true photographic reproductions of old, restored photos. Its 10-mil RC paper base gives prints a thick photographic feel, and keeps the paper cockle-free. This Epson paper is well suited for your restored wedding, portrait and fine-art color photographs and is only ever used with premium Epson Inks. Ultra Premium Photo Paper Luster is engineered to ensure the highest resolution and highest color saturation possible. Our Cold Press Bright Textured Matte Paper is an acid free, 100% cotton rag media with a bright textured finish. This paper has an extremely-high color gamut and black density and is optimized for UltraChrome, and Archival Ink. Perfect for old and hand colored matte-finish photos, it is acid, lignin, and chlorine free, and pH buffered with calcium carbonate for a true archival sheet. Metallic Photo Paper Glossy from Epson features metallic paper with a resin-coated base and a vibrant glossy finish capable of producing images with high sharpness, good dynamic range, and a wide color gamut. This paper works especially well with black and white portraits. This unique media offers the same deep blacks, subtle tonal gradations and long-lasting results as the darkroom photo papers of old. Its fiber base has a rich surface, a continuous tone and soft gloss that are ideal for creating stunning color or neutral black-and-white prints that retain the look and feel of traditional fiber paper. DID YOU KNOW? We always work with very high resolution scans in our photo restoration services. A scanner setting of 300 dpi will allow us to make an image the same size as the original. However, to give you options in the future, we always scan photographs at settings of at least 600 dpi - normally more. This allows us or you to make enlargements of 200% or more. It is true that software such as Photoshop uses clever algorithms to bring out the most in resizing digital images. But it is always best to use a calibrated high quality scanner to achieve enlargements in the first instance.